Mesquite, Nevada is proud to present the 2018 Nevada Open Golf Championship November 6–8, 2018 at the Palms and CasaBlanca golf courses. 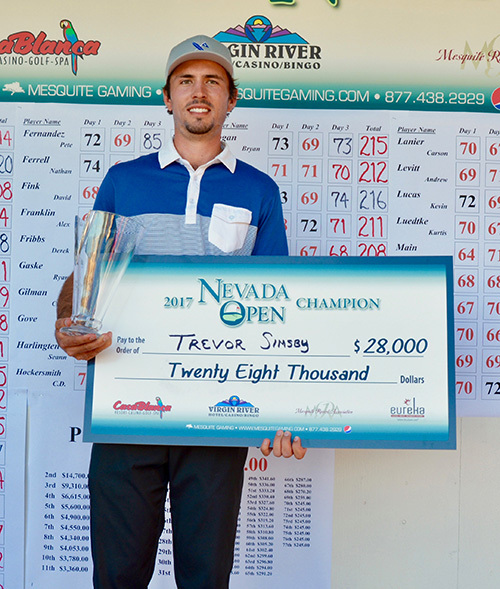 With over 40 years of championship history, the Nevada Open is one of the most respected and anticipated golf tournaments in Nevada. The Nevada Open is a 54 hole event with a cut after 36 holes. Each player will play one round at the Palms and CasaBlanca Golf Clubs before the 36 hole cut. The cut will take place at 30% of the field plus ties. Prize purse of $140,000 is based on a full field of 244 players. The championship round will take place at the CasaBlanca Golf Club on Thursday November 8, 2018. In the event of a tie for the overall Championship there will be a sudden death playoff to determine the overall winner. 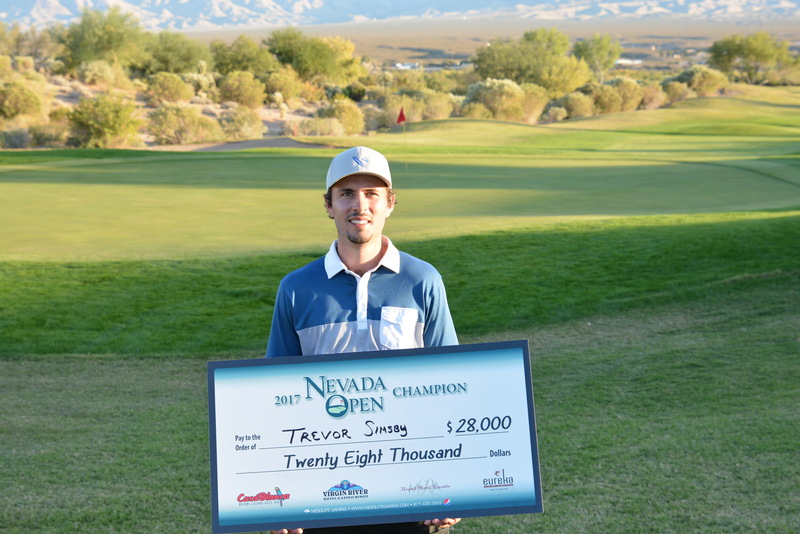 Our 2017 Champion is Trevor Simsby from Carlsbad, California. Practice rounds are available on a limited basis. It is the players’ responsibility to secure their own tee times. The practice round green fees is NOT INCLUDED in the entry fee. Please call the course directly to make your practice round tee time. 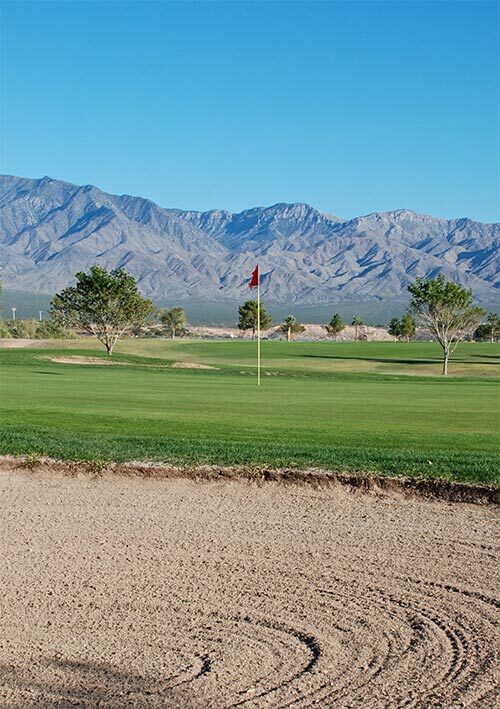 Mesquite, Nevada enjoys ideal golf weather in the month of November. The warm desert climate provides over 300 days of sunshine a year. November temperatures can range between 67 degree mid-day highs and 37 degree night time lows. Spectators are highly encouraged to follow players as a gallery during the Nevada Open Championship. Individuals assume all risks incidental to a spectator at these events and release the Nevada Open and Tournament Committees from any and all liabilities. PLEASE NOTE: Rule 8-1 in the Rules of Golf states that a player may receive advice only from his or her partner or caddie. The penalty for giving advice is two strokes in stroke play. The player is responsible for following this rule. During play, minimal contact is permitted between spectators and players (or their caddies). Spectators must walk and are asked to stay on the cart paths when possible. Spectators with Disabilities: Spectators requiring motorized transportation due to severe physical disabilities must notify the Nevada Open prior to the Championship and receive permission to rent a cart from the Tournament Director. Spectators that are granted use of a cart must pay the cart fee to the host site and a Handicap Flag will be placed on the cart to notify all officials that the cart use has been approved (all carts must remain cart path only). Caddies are allowed; however, the Nevada Open Committee is not responsible for furnishing caddies and recommends that players bring their own. Players are not required to employ a caddie for the Championship and may carry their own bag. If written cancellation is received before October 19th, 2017 a full refund will be given minus a $20 processing fee. If a cancellation is received October 20th to November 1, 2017 you will receive a refund less $100 processing fee. No refunds, regardless of circumstance, will be provided November 2nd, 2017 or after. All cancellations and refund requests must be submitted in writing. Please allow 30 days to process requests. If a player must withdraw from the Nevada Open once it has begun, he or she should notify the Nevada Open Committee or tournament site as soon as possible with the reason for the withdrawal. “No-Carding,” “No-Showing,” and withdrawing from an event without a valid excuse is NOT acceptable. All players needing to withdraw from an event must notify a member of the Committee and return their scorecard prior to leaving the tournament site. 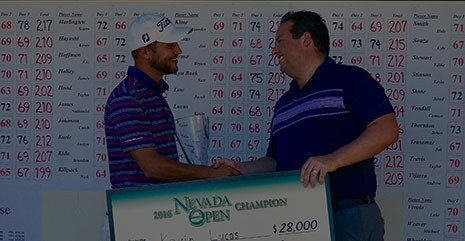 Failure to do so will result in a one-year suspension and loss of any future exemptions from any Nevada Open Events. 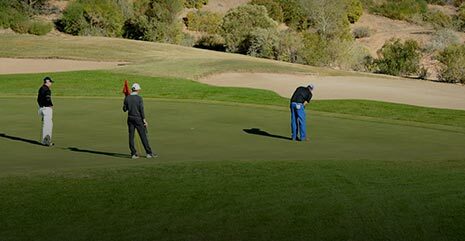 Contestants are expected to (1) know and play by the Rules of Golf, (2) conduct themselves at all times in a sportsmanlike manner, (3) respect the golf course and the rights of other contestants, (4) fulfill their playing obligations and (5) know and abide by the Nevada Open Pace of Play Policy. If the Committee considers that a player is guilty of a serious breach of etiquette, including but not limited to unsportsmanlike conduct (cheating, damaging the golf course, defacing club property, using loud obscene language, throwing clubs, etc. ), it may impose a penalty of DISQUALIFICATION and possible suspension from future play in the Nevada Open. Any disciplinary actions imposed on a contestant by the Nevada Open may be formally communicated to a representative of the contestant’s club and/or to any other allied golf association that the Nevada Open deems appropriate. Practice Range Balls will be provided to all contestants as part of the players entry fee before the tournament rounds of golf. All practice round balls utilized after the tournament round the player will be responsible to pay the pro shop the listed price for practice range balls. At The Nevada Open, players shall present themselves with a neat and clean appearance. Under no circumstances shall shorts or denim pants be worn by competitors. Khakis or slacks and collared shirts must be worn by all players. Hats must be worn straight (not backwards). Failure to do so may lead to disqualification. 9am- Nevada Open Pro-Am- Prize purse for Pro- Bring your own team- or let us know you would be willing to play. Cut based on 30% of field plus ties- Prize purse based on full field of 224 players. Registration for the 2017 Nevada Open has not yet started. Please contact sales@mesquitegamging.com with any questions. Registration for the 2017 Nevada Open Pro Am has not yet started. Please contact sales@mesquitegamging.com with any questions. Each Team (1 pro and 4 amateurs) will play a shamble format. Each team member will play a tee shot. Each team will use a minimum of 2 players drives in their round. After choosing the preferred tee shot, each team member will complete the hole with their own ball. NOTE- with the exception of the tee shot, all balls must be played down. All team members will record GROSS scores on each hole. Team score for the pro-am will be determined using the two low net scores for each hole. Scorecard must be signed by the professional and one amateur team member. 50% of the Amateur handicap will be utilized based on the October 1, 2017 GHIN Handicap update. All ties will be broken by a scorecard playoff, beginning on # 1 handicap hold. In an effort to speed up play, please pick up your ball if your score will not help the team score. USGA Rules will govern play, except when altered by local rules. Yellow lines and/or yellow stakes define water hazards. Red lines and/or red stakes define lateral hazards. Out-of-bounds are defined by whites stakes or fences. Local Rules are in effect and located on a separate sheet that will be supplied to the contestants prior to play. Entry fee into the Nevada Open includes 3 nights accommodations (Monday-Wednesday) at the CasaBlanca Resort. If you would like to book additional nights before or after the tournament please call 888.GETAWAY (438-2929). Our overall 2017 low amateur was Torey Edwards from Long Beach, California. He was -7 for the tournament.